I discovered Mothy and the Squid on Etsy last year, when I was looking for the perfect rainbow yarn to knit my son a pair of socks (I ended up using some Regia). I can’t say rainbow yarns had ever attracted my attention until then, but the yarns at Mothy and the Squid were spectacular and inspired, and there were so many gorgeous rainbow and rainbow-esque offerings. WOW!!! I ended up buying a rainbow sock blank from the Etsy shop, with absolutely no idea of how I was going to use the yarn – maybe socks, maybe something else. It was my first time trying a sock blank, too! Eventually I decided that I’d pair this rainbow yarn with a neutral solid and knit a 2-color shawl out of it. Several of my friends had made shawls like that, and I loved their results. Rainbow sock blank paired with Lorna’s Laces Shepherd Sock in kerfuffle. The two yarns are a great match in terms of composition (both are merino/nylon blends), yarn thickness, and the way in which they are plied. I first tried the Nymphaledia Shawl, but I just wasn’t crazy about knitting it. I felt the gray dominated over the rainbow yarn, and I always lost track of my short rows. I ripped, and tried again using the Meadow Grass pattern. I liked the way the two yarns knit up much better, and the project flew by! I finished it within a week or two of starting, I think! 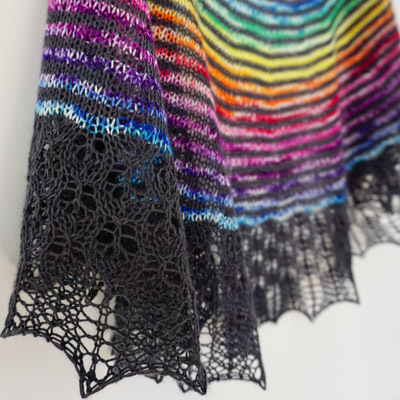 Needles and Finished Dimensions: I used US 6 needles, and the shawl is about 54″ across the top, and 22″ deep. I modified the pattern a little bit to get more rainbow in there, and ended up shortening the gray border section as a result. In an ultimate head-meets-desk moment, I discovered an extra mini ball of the gray yarn after everything was bound off. D’oi! 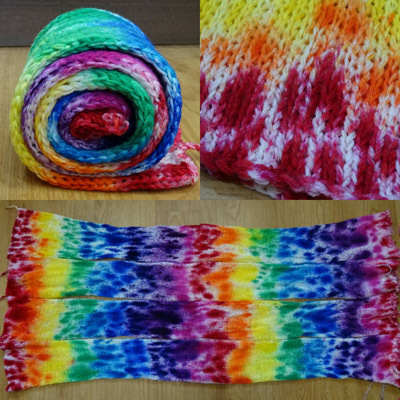 I have a ton of the rainbow yarn left over – I only used up about 1/3 of what I had in that sock blank! And now I’m wondering, what should I knit with the remainder? What a beautiful shawl. I knitted my Meadow grass a few years back and love it. I should block it again to give it a bit of a clean up. That is gorgeous! I love rainbow things, and I love brightly colored things interspersed with dark gray. 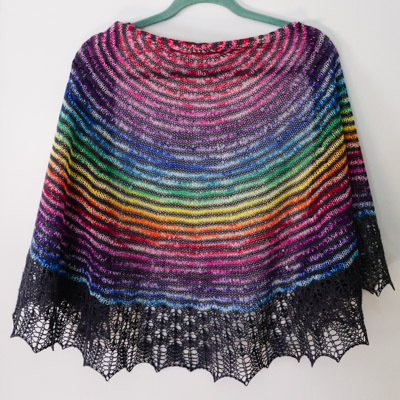 This shawl is perfect! It’s so lovely! Now maybe a couple of kiddo-sized rainbow hats to match? The colors are beautiful. Love the lace border!